Explore our peaceful river & enjoy nature. Near the Gulf for fun deep-sea fishing or walking on the beach. A river runs right through the resort for your fishing pleasure! Enjoy pool-side fun or a cookout at sunset! Close together sites, lots of traffic all day on our lane of the campgrounds. Everybody seems to have at least 2 dogs. Friendly - mostly full time permanent residents - or snowbirds. Feels old and out of date. Lots of books in the clubhouse but little else. Strong methane gas comes from pond and swamp areas setting off our gas/ Monixide detector in the middle of the night. Bathhouse ( under renovation maybe) only has 2 showers. One huge handicapped stall and one without a place to hang clothes, put a towel or shampoo etc, or to change without being naked in the open room for all to see. Very close to Homosassa Wildlife Park. On the back side Yulee road runs right next to sites with loud motorcycles, trucks etc.— not peaceful at all. When we arrived staff was power washing a park model across from us and other construction noise was coming from somewhere along with several trip of heavy trucks and skip loaders. The power washer was the loudest machine imaginable for about 3-4 hours. Paid for 4 nights but leaving early. 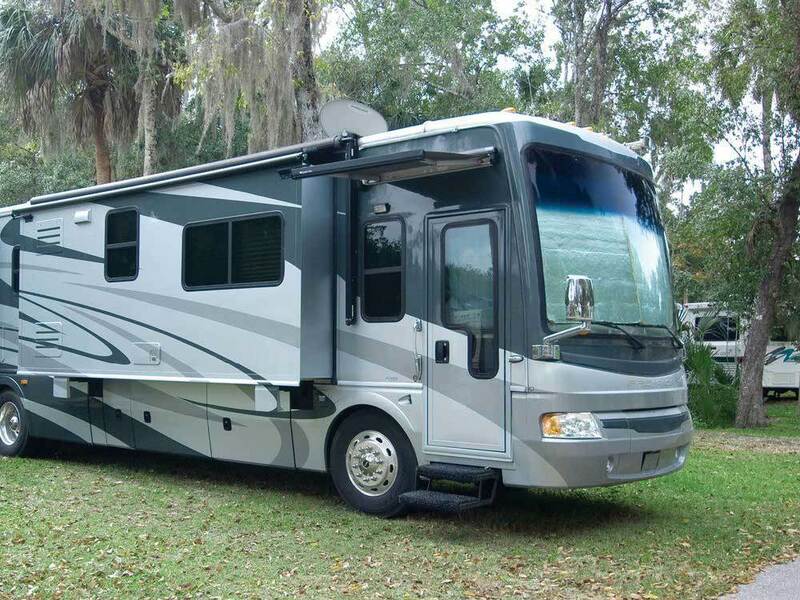 I don't understand why RV parks don't understand the importance of Wi-Fi to full time RVers. We were right next to a repeater and had little to no reception. I mentioned it to the front desk and was told it should work and when I said it wasn't they gave me a ridiculous blow off. As mentioned, roads are narrow, some spots are very small, sites are close together. Except for the Wi-Fi situation, not a bad campground. There are a very high percentage of full-time residents in this park. Campers were friendly and welcoming. Roads in the park are very narrow and sites are close together, which can make parking difficult at times. Setting was nice. Water, trees, Spanish moss, etc. gave it an "old Florida" feel. It is close-by a wonderful state park on the Homosassa River, which is full of Manatees and other wildlife - a real plus. Bathroom facility was nice, but there is only one full-service bathroom for the entire park. Tended to be very crowded at times. Park was pet friendly, but there was no off-leash dog park. All RV parking is on a 90 degree angle to the road, and roads are so narrow, it was impossible to back into the site they assigned (M7). Site was next to a swampy area and even as we were half way in we were getting Stuck in the Mud ....thank goodness we have 4 wheel drive. After numerous attempts, we finally gave up and they assigned us another site just a bit further along. All the neighbors (and even the guy assigned to take us to our site) told us that everyone has problems getting into #7 unless they are about 22 feet or smaller (we are 31). There were other open sites, not sure why they tried to put us in one that was so inferior. Met a lot of very friendly campers, it's a very Pet Friendly park, and the pool was large and heated. Virtually all the electric posts and many water hookups were in very poor condition. There is absolutely no cable TV despite what they claim. Cell service was surprisingly quite adequate. The park is adjacent to a wonderful state park (that doesn't offer camping) which was the real reason we chose this park. Probably won't return.